"The plant fossil record provides evidence that the genus Metasequoia was widely distributed and experienced a wide range of climatic and environmental conditions throughout the Northern Hemisphere from the early Late Cretaceous to the Plio-Pleistocene. Today the genus is limited to one species with approximately 5’000 mature individuals growing in the Xiahoe Valley in southeastern China. This book is a distillation of the collective efforts and results of the world’s Metasequoia specialists and enthusiasts. It is the most up-to-date and comprehensive reference source for the genus and the authors have sought to incorporate obscure, hard-to-get and non-English reference sources. The book reviews what is known about the biology, ecology and physiology of fossil and living Metasequoia, current research directions and problems that remain unresolved. 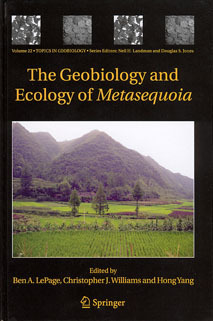 This book presents a definitive oveview of fossil and living Metasequoia and was written by sixteen of the world’s experts on this important genus. Given the reality of increasing human pressure and the inevitability of global change, efforts to conserve this ancient genus are underway. This book will be of interest to botanists, ecophysiologists, geochemists, climate modelers, geneticists, naturalists, science historians, and gardeners and will be useful as a supplemental text for advanced undergraduate and graduate level courses in paleoecology."